We play Axis & Allies… while eating Dill Doritos. 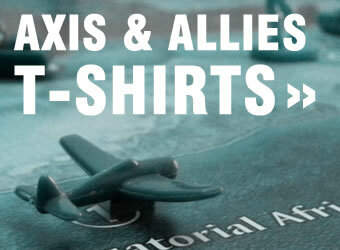 Apparently, we design Axis & Allies clothing (t-shirts, hoodies, hats, and more!). Who knew? This site is put together by a quad of Axis & Allies game players who jump into somewhat hibernation mode every winter and enjoy Axis & Allies on weekend afternoons and evenings – usually accompanied by sights and sounds of Hockey Night in Canada and the deliciousness of craft beer. Oh, there’s a dog, too. He hasn’t quite mastered all the intricacies of the game yet though. We’ll be slowly be putting together resources to help you play Axis & Allies. Just need the rules? We’ll put them on our Rule Books page. We tweet, too. Follow us if you’re bored – or if you’re not.